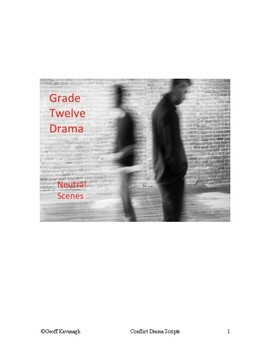 This product includes 10 Neutral Scenes from the Conflict Drama Series - Gr 12. 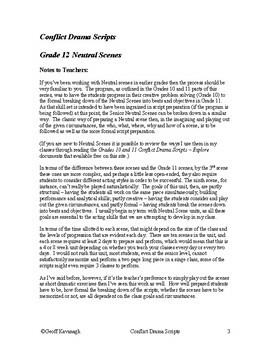 It also includes 'Notes', for both students and teachers, on preparing, rehearsing and performing these scenes. Neutral scenes are used in actor training to have students focus on the Given Circumstances of a scene: the who, what, where, when and how. 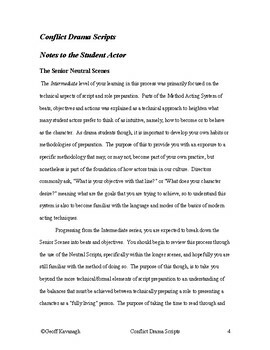 The scenes are written in a manner in which none of these aspects are given and students are required to 'solve the problem' of the script, in which they invent the given circumstances in order to give the scene meaning. The beginning scenes in this unit are meant to be rehearsed and performed in a single day, the longer scenes are intended to be played out over a period of two days. The general length of the unit is approximately 20 classes. All these scenes are original, and have been written for the age and grade level of the students. They have also been extensively tested and performed in my classes for years. This is not a 'classroom kit' containing tests, rubrics and answer keys, rather these are the materials to be put into student hands each day. Teachers should note that this unit is the beginning of a script based approach to teaching drama (Conflict Drama Scenes - Gr 12) that is a continuation of the work done with the Conflict Scenes in Grade 10. The scenes, the teaching methodology and the use and purposes of the scenes are 'stand alone' though, in that it is not necessary that students have prepared previously with these scene types. This is not a 'classroom kit' containing tests, rubrics and answer keys, rather these are the materials to be put into student hands each day.